This rainfall interception model is designed to help target audiences to determine the amount of rainfall intercepted by different tree species during each rainfall event. In the course of the interception calculations, the model also gives information regarding the canopy water storage capacity of different tree species, as well as the relative importance of each stage involved in the interception process. This model predicts rainfall interception by various tree species based on information such as local precipitation, evaporation rate, and several tree crown parameters. ​The first step calculates local precipitation rate and evaporation rate. This step would require meteorological data inputs such as air temperature, relative humidity, wind speed. Some of these data could be obtained from Environment Canada. 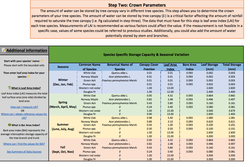 The second step calculates the total water storage capacity (mm) by tree crown of different species. This informs you how much rainfall could be stored on tree canopy before it is saturated. Additionally, you could also add the amount of water potentially stored by stem and branches. This step is critical as it is later involved in the calculation of the amount of rainfall required to saturated the canopy. The amount of rainfall needed to saturate the canopy is usually larger than canopy storage capacity as long as the evaporation continues. The data requirement for this step is leaf area index (LAI) for each tree species. Measurements of LAI is recommended as various factors could affect the value. If the measurement is not feasible in a specific case, values of some species could be referred to previous studies. The third step uses the equation in Gash model to determine the amount of rainfall required to saturate tree canopy. The last step calculates the interception based on two types of rainfall situation: small rainfall insufficient to saturate the canopy (Ic) and large rainfalls sufficient to saturate the canopy. The latter involves three stages involved in the interception process: 1) Interception (Iw) during wetting up of the canopy (i.e. before saturation); 2) Evaporation during canopy saturation (Is); 3) Evaporation after rainfall ceases(Ia). See conceptual framework of this calculation. This model is an initial version of rainfall interception model. A few limitations and recommendations are listed in the Model Assessment. Future versions of the model will incorporate measured LAI for different tree species, as well as the inter-species variations regarding leaf-on and leaf-off season. Spatial distribution of rainfall associated with crown shapes and wind direction could also be considered in the future models. 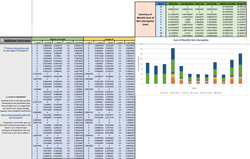 Adjusting different parameters in this model is recommended to see the relative sensitivity of each parameter. As urbanization proceeds, extensive areas of vegetated? landscape will be replaced by urban development. If the new urban developments are not well-designed, the area of impervious surfaces will increase and potentially aggravate current challenges with stormwater management and flooding. In the District of North Vancouver, stormwater management is a priority, especially during the wet winter season. Utilizing trees in new developments, as a core green infrastructure component, can augment stormwater conveyance (grey) infrastructure, and provide additional benefits such as cooling effects, net carbon emission reduction, and air quality improvement. This initial version of the rainfall interception model provides useful information to address several aspects of urban stormwater management for different stakeholders. It supports the process by which the amount of stormwater runoff can be reduced and delayed by urban trees, as well as the stormwater management costs that are potentially avoided by planting urban trees. A full guideline of tree species selection considering broad aspects of urban trees’ benefits and its adaptation to climate change was provided in Design Guidebook: Maximizing Climate Adaptation Benefits with Trees (2016) and Urban Forest Climate Adaptation Framework for Metro Vancouver (2016).